"Worlds' Finest - Part 2"
Epoch faces off against Superman, Batman and Robin and quickly grows tired of the battle. He conjures an Omega Barrier, a trap that is as impassable as the event horizon of a black hole, and imprisons the heroes before flying off to conquer the world. Back in the 853rd Century the Superman of that era manages to break free of the time loop Epoch had placed him and Batman in. He breaks Batman free but even though they are aware of the time loop they are still stuck in it. Batman, as ever, has an idea. Back in the present Epoch traps more heroes before declaring himself ruler of the world. Inside the Omega Barrier Superman and Batman use theoretical physics to break free of their trap. They attack Epoch, who jumps back into the time stream. His ride is uncontrolled however and he ends up facing off against the Batmen and Supermen of various eras until he is finally back in the 853rd Century. The Superman and Batman of that era are waiting for him having escaped the time loop by going into the 5th Dimension and then coming back to the 3rd. The Robin of that era is confused as to why Epoch keeps heading back to the same era again and again despite his repeated defeats. Superman believes that Epoch is so obsessed with the past that it blinds him to the possibilities of the future. Story - 4: This was a fun issue so I am having a hard time writing this part of the review because as fun as the story was there wasn't a whole lot to it. While I enjoyed the first part I couldn't help thinking as I was reading the conclusion to "Worlds' Finest" that this story seemed more about throwing out references to the past than focusing on what I thought was the interesting part of the story and that is Epoch's motivation. Here is a villain that, as Superman states at the end of the issue, is so obsessed with the past that he doesn't use the abilities he has to find a spot in the future where he can be happy. Instead we get references to the MIRACLE MONDAY novel and shots of Jimmy Olsen as a WGBS newscaster and funky bits of science and so on. Don't get me wrong. I like that sort of thing. I really do. I guess I was just expecting more out of this issue. Still this was a solid read and I can't be too hard on it, hence the four out of five rating. Art - 4: The art was a little more uneven this time out but I still dug it. The Batman of the present may have looked a little funky but I was impressed with the variety of costumes Merino came up with for the various Super and Bat people. While the art is definitely of the current era it also has a very timeless feel to it. Cover Art - 1: I really hated this cover. 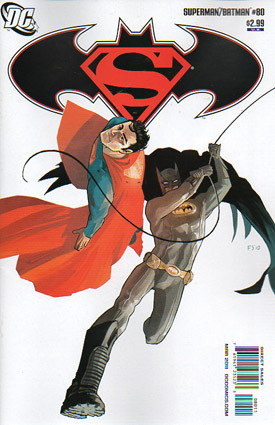 I understand that it is part of the cover theme stretching across the DC line for this month but I just don't like the way Superman and Batman look here. The style is just not something I care for.